Okay Beek-Geeks, tonight’s the night you’ve all been waiting for… Martha makes her appearance on The Fabulous Beekman Boys. It is destined to be a good thing. If you haven’t seen the show, let us catch you up. Brent Ridge is a doctor who used to work for the domestic goddess and Josh Kilmer-Purcell is a marketing exec and former drag queen named Aqua. In 2008, they gave up the calamity and chaos of the big city for, well, the calamity and chaos of a farm – the Beekman Mansion in Sharon Springs, New York. 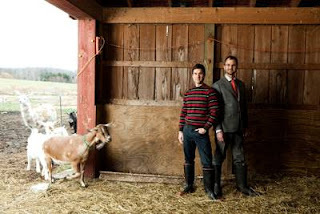 There they grow organic vegetables, raise goats (with the help of their friend Farmer John), and oversee their own product line – Beekman 1802, which sells goat cheese, goat milk soap, and high-end crafts from local artisans. So far on the show the boys have hosted a wedding, packed and shipped thousands of bars of soap, and organized a local Harvest Weekend. So what’s in store? We spoke with Brent and Josh recently and got the dish on what to expect on upcoming episodes and wrap up a few loose ends from previous shows. And, you may be surprised to know that the reality stars don’t see the shows until they air, so if you live tweet with them each Tuesday night, you’ll get their off-the-cuff reaction to each episode as it unfolds. PASSIONISTAS: Do you plan in any of the upcoming episodes to merge your past and present lives – maybe a party with the local farmers, the Amish community, and drag queens, and Martha Stewart all at Beekman Mansion? JOSH: I don’t think we have them all at once, no. But there are upcoming episodes with Martha and I think there’s some more with the community. The interesting thing is we actually don’t get to set the episodes beforehand either. So we see them when everybody else sees them. We have to live Tweet during them too, well not have to, but we choose to live Tweet during them, too. And I’m always trying to watch and Tweet at the same time. PASSIONISTAS: Is there really a Mary Beekman's ghost and will we see her play into the show? BRENT: There actually is a ghost. JOSH: Neither one of us were big ghost believers at all. But there are definitely things that happen in the house. And there's no way to explain the things that happened. JOSH: So you'll have to tune in and see what they find. PASSIONISTAS: We have to ask, did you ever get your birthday table into the house? JOSH: Yes, we did – after much more bickering. But we wound up having some people come over and help us take it apart and carry it back in. It’s really beautiful. We designed it so that it would take up the whole room. So it’s this huge table and we’ve had several parties. Actually, I think you’ll see in one of the episodes coming up everybody eating around the table. It was such a sweet, sweet surprise. I mean I think, in the first few episodes, some people have written and think that Brent is overbearing and nagging, which he is. But I’m glad that they see the sweeter side of him, too. He worked really hard on that. That took a really long time to build. PASSIONISTAS: How long did it take? BRENT: I worked on the table for about three months. PASSIONISTAS: Whose idea was the Goat Cam? JOSH: We actually always wanted to do a webcam but we didn’t have the technology so we brought it up to Planet Green and they had the idea simultaneously. So they came and put it up for us. Have you spotted Polka Spot on it? PASSIONISTAS: We have not seen Polka Spot, no. Just the goats. No llama. JOSH: Polka Spot does wander into view every once in a while but she’s still in contract negotiations. PASSIONISTAS: Speaking of goats, Brent, when Farmer John says things like he doesn’t know you’re going to be a good farmer, does that hurt? How does that make you feel? BRENT: Ya, certainly my pride takes a hit when he says that. But my personal view is that in order for us to make this a successful business, a sustainable farm, that it takes people with lots of different talents. And John’s talents are managing the goats and producing the very best milk possible. And my job is to handle the business side of things. So, you know, it really takes a village. To see a Fabulous Beekman Boys slideshow visit Examiner.com.